Columbia Men's Steens Mountain Full Zip 2.0 Soft Fleece Jacket, Charcoal Heather, Large | What Should I Say? The next generation of a Columbia classic, this outdoor staple features a finely tuned fit and a soft-yet-rugged filament-fleece fabrication to keep you warm when temperatures plummet. SOFT FABRIC: This Columbia Men's Steens Mountain Full Zip 2.0 fleece is crafted of soft 100% polyster MTR filament fleece for ultimate warmth. 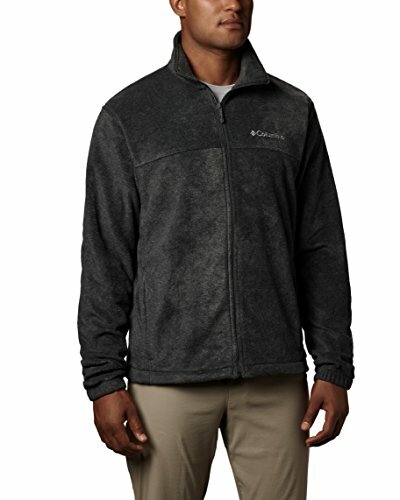 HANDY FEATURES: This Columbia men's fleece jacket features two side zippered security pockets to keep your small items secure. ULTIMATE COMFORT: With a collared neck and zippered closure, this Columbia men's fleece jacket is designed to give you ultimate comfort during cold winter days. CLASSIC FIT: With a modern classic fit, Columbia's Steens Mountain Full Zip 2.0 Fleece is light and comfortable enough for outdoor activity. Columbia's Steens Mountain Full Zip 2.0 fleece is a outdoor staple during cold winters for it's warmth and comfort.